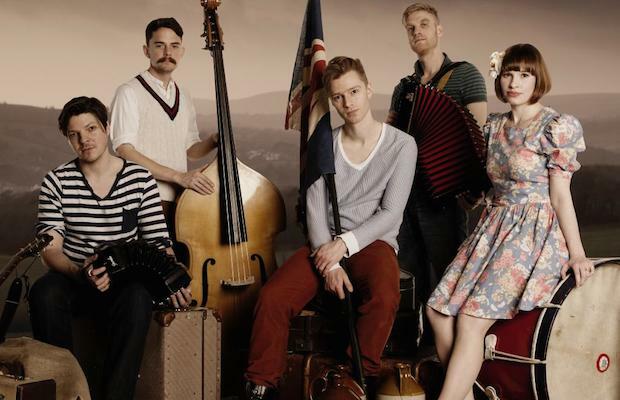 Crowed “the hardest working band in the UK,” English folk punk sextet Skinny Lister have spent the last several years independently touring and honing their craft, amassing international acclaim with their 2012 release Forge & Flagon. With experience performing virtually every single festival in the UK and countless others across Europe, as well as America’s SXSW, Warped Tour, and Coachella, Skinny Lister have shared the stage with countless punk and folk heavyweights. With that much of a pedigree it’s shocking that a) the group have not yet played Bonnaroo and b) they’re relegated to the Club Stages this year. Nonetheless, they’re an absolute essential act to catch, and one of the hands-down best bands of this summer’s punk crop. Co-fronted by Daniel Heptinstall and Lorna Thomas, Skinny Lister’s sound lands somewhere between the territory of folk punk singer-songwriter (and fellow Brit) Frank Turner and two acts they’ve shared the stage with: Dropkick Murphys and Flogging Molly. Rather than jumping on the trendy folk revivalist bandwagon, Skinny Lister call back to older, more traditional stylings, and fuse that heritage with faster, more aggressive, and modern sensibilities, all held together by a lyrical earnestness and air of sincerity that few bands can match. They’re a versatile, authentic, and unique band, and add a welcome element of diversity to this year’s Bonnaroo. The Lumineers Add Second Ascend Amphitheater Show on Sept. 22!